1. Always have adult supervision. 2. Keep a portable telephone near the pool. 3. At least one adult family member should know CPR. 4. Never swim when there is lightning or thunder. 5. Do not allow running on the edge of the pool. 6. Keep large floating toys out of the pool - they block the view. 7. Keep deck areas free of clutter. 8. Teach all children to swim as early as possible. 9. Never allow young children to dive into a pool. 10. Install pool lights for night vision. 11. Have a clear view of the pool from inside your home. 12. Remove automatic vacuums from the pool before swimming. 13. Keep pool chemicals locked away. 14. Never allow extension cords near a pool. 15. Make sure your babysitters can swim - have them show you. 16. 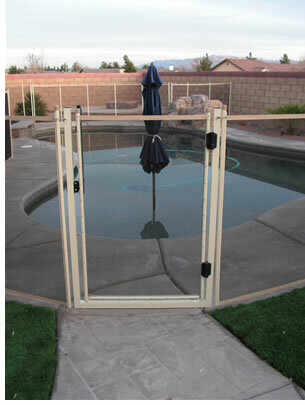 Always install a Pool Guard swimming safety fence.